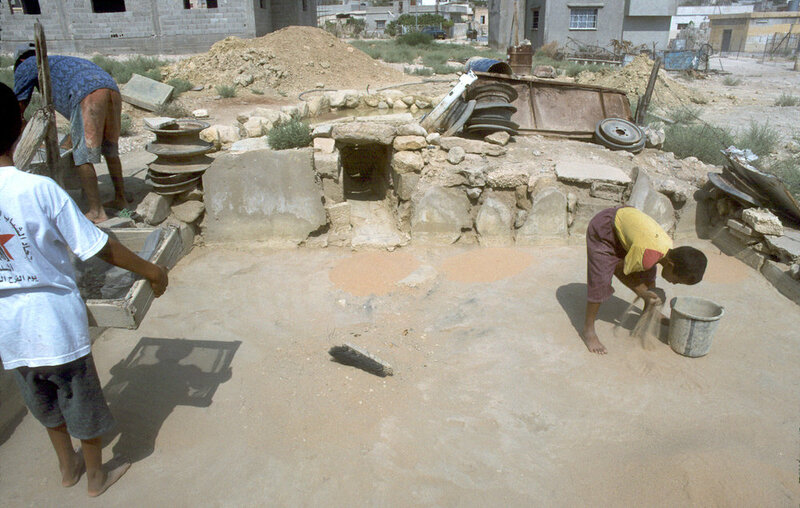 In the process of preparing clay for use in a traditional workshop, Amzi's boys help him prepare the basin for receiving a slurry of water and suspended clay. The surface of the basin is covered with sand to keep the sticky clay from adhering to the basin itself. Note how the boy on the left uses a box with a screen to sift the sand and help remove unwanted bits of rock and other debris from the sand. Note also the chute at the end of the basin. Beyond it is a smaller basin where crumbly clay is already soaking in water. Amzi and his boys live in Aqabat Jebar, a refugee camp near Jericho.